FountainBlue’s August 11 When She Speaks, Women in Leadership Series event, on the topic of Politics in the Workplace, The Good, The Bad, and The Ugly. Below are notes from the conversation. 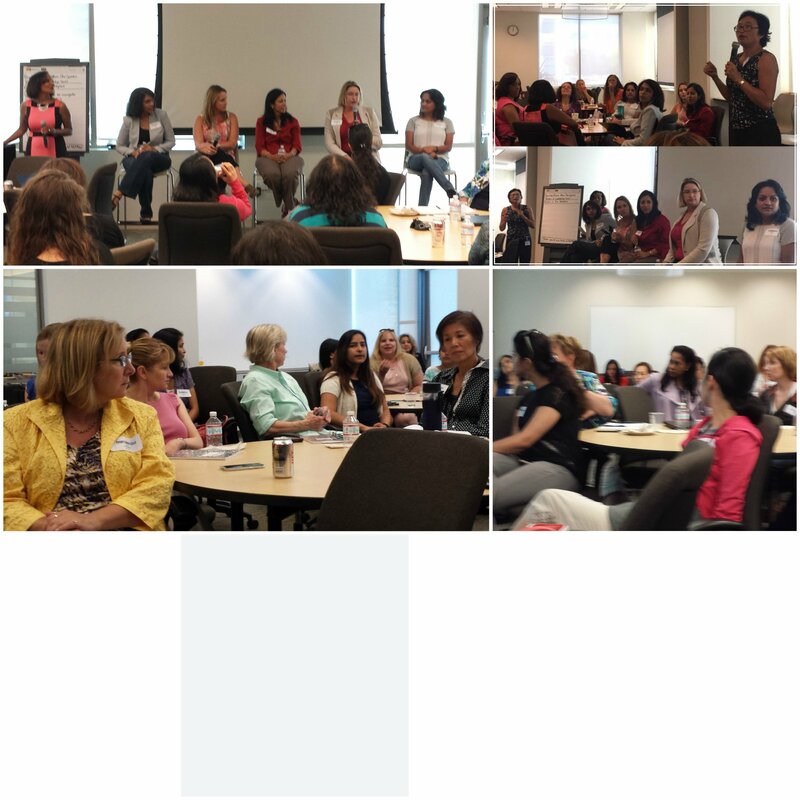 We were fortunate to have such courageous and accomplished women on our panel, who come from many different educational levels, corporate and technical backgrounds, and frames of reference. They graciously and generously shared their wisdom around navigating politics – the art and science of influence. Accept that politics is a part of life and decide to work with it and learn from it. It’s a given that there will be politics as not everyone will be on the same page with the same agenda at the same time. Know yourself and what your values are and what your value-add is. This will help you identify who you are and stay strong to your integrity and principles. This will also help you find the courage to stop fearing the fear and take risks in ways that make sense and for the right reasons. Ever be that confident, energetic, enthusiastic person – even if you have to fake it to get there sometimes. Accept that there will invariably be misalignments between people, teams and groups, and work to understand the perspectives and objectives of all those involved. Assume that others in the group have the best intentions . . . unless the data shows otherwise. Know the difference between misalignment of opinion and misalignment of values. Never compromise those core values. Create and build a support network that helps you keep centered, ‘smelling the roses, blowing out the candles’. Understanding what needs to be done, who’s involved and what their motivations will help you better understand and manage the situation. Resources such as time and money always adds conflict to any group dynamic, whether a company is huge and established or just starting out. Understand why different people, teams and partners want what they want and start the negotiations with that in mind. Separate the bad politics which is around self-centered empire building to the good politics where people may have different plans and needs, but are overall aligned on the goals. Be curious – listen to what others have to say. Always try to understand what’s motivating them. Communicate with clarity, courage and transparency with conversations based on facts and data. Communicate outside the direct network and to the larger network, including execs to keep them in the loop, where appropriate. Embrace interactions as learning experiences. Know the difference between what you own and what someone else owns and accept that you can only change yourself. For example, if someone pushes you under the bus, perhaps you did things that set them up to do that, but in the end, the other person pushed you under the bus, so approach with caution. Connect with people at all levels and build networks and relationships of trust BEFORE you need to count on them. In working with difficult people, find a way to disagree amiably. Start conversations and communications focused on what you have in common, which is probably more things than you think in the heat of the moment! Build relationships with men and women – don’t make gender a criteria for the people you have in your network. Rule of thumb: if a woman opens a door, people might wonder why she’s so pushy. If a man opens a door for the woman, people will wonder what’s special about that woman. In general, tech companies are more accepting of women leaders who prove themselves than in other industries such as automotive or military. But that doesn’t mean that all tech companies will treat women better, or that all companies are equal. Find that company, culture and team where you feel you can succeed, and make plans to walk if it’s not all that it appears to be, in a bad way. Hint: When you find a job and a team that is super focused on an exciting new project, there may be less time to engage in petty politics. The bottom line is that those who accept that politics is part of the game of life, those who know who they are and stand behind those principles, those who put the project and the team above themselves will better succeed in navigating political waters. This entry was posted on August 14, 2015 at 10:51 pm and is filed under When She Speaks. You can follow any responses to this entry through the RSS 2.0 feed. Both comments and pings are currently closed.